The Boye NeedleMaster Interchangeable Aluminum Knitting Set is the best interchangeable needle set we have found at a price that is affordable for most people. Connectors allow you to make extra-long cables for even the largest knitting projects. The case makes it easy to organize needles. We’ll share what we like and dislike about using the NeedleMaster Interchangeable Set, and take a look at how it compares to other interchangeable needles. We’ll also cover the things you need to consider when buying interchangeable knitting needles, such as cables and joins. Beginning knitters will appreciate the Boye NeedleMaster Interchangeable Aluminum knitting needles for delivering a surface that helps stitches stick a bit, but gives just enough movement to learn how to keep stitches in place on slippery needles. An added bonus of these needles: long lasting without breaking the bank on your purchase. Experienced knitters will appreciate the lightweight feel of these needles and the reliability that comes with Boye’s reputation as a manufacturer. The NeedleMaster Interchangeable knitting set provides knitters with an excellent combination of needle sizes and lengths in one convenient carrying case. Lightweight feel with the durability of aluminum. Set includes both pointed and round tips for more yarn choices. Different colored needle tips help locate the same sized needle for your next project. Wide range of sizes in one convenient carrying case. Cables and cable connectors included give versatility to knitting projects – from hats to afghans. Is the Boye Needlemaster Interchangeable Knitting Set Worth It? The needles are made from lightweight aluminum and screw into plastic cords. Aluminum allows the yarn to slide easily along the needle so you can knit faster, but the cord can create some drag. The cord can also be stiff, especially when using the Magic Loop method. These interchangeable needles come with a zippered faux leather case, making them great for travelers and anyone who loves to be organized. 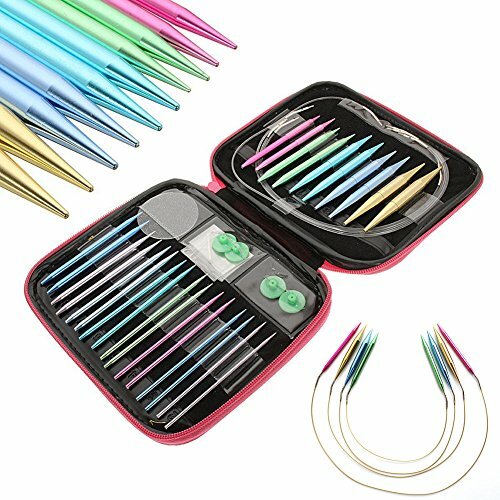 The case holds all of the needles and cables for making circular and flexible straight needles. Needle placement is numbered so you always know where to find them. Also included in this set are stitch holders, end caps, cable connectors, a tightening pin, needle gripper (to help with tightening or loosening needle from cable), and an instruction booklet. Cables, included in the case, make lengths of 20, 24, 29, and 36 inches. Additionally, the two cable connectors included give you endless possibilities for creating different length knitting needles. Even better – you can turn two cables into long flexible straight needles using the included end caps. The Boye NeedleMaster Interchangeable Aluminum knitting needles give knitters two tip styles – pointed and round. You’ll find a more pointed tip on smaller sized needles while larger sized have more rounded tips. The eight needle sets included in the carrying case, sized US 2 – 15, provide variety for all your knitting projects. Each size is a separate color, making it easier to find the one you need when starting a new project. All yarn types, from alpaca to yak, work well with this Interchangeable knitting needle set. As the largest needle size is 15, super bulky and jumbo yarn (weights 6 and 7 respectively) are probably not the best choices. More durable than wood, bamboo, or plastic, these aluminum needles provide hours of knitting for all skill levels. Always remember that the aluminum needles and the plastic able can bend and break. Take care when storing these needles in the provided case to assure theystay in tip-top shape. Some knitters experience loosened screws while knitting with the NeedleMaster Interchangeable needles. Additionally, screws can strip over time, which lessens the ability of the needle to stay connected to the cord. When knitting, it is a good idea to periodically check the connection between the needle and the cable. We recommend tightening them whenever you pick them up after laying them down. The more you use these needles, the color may begin to wear away. Some knitters like to show this wear and tear as it proves just how much they like to knit! Replacement parts are available if needed. You don’t have to buy a whole new set, just individual pieces. Knitters like the lightweight aluminum of the Boye NeedleMaster Interchangeable knitting set. Although a little heavier than bamboo or plastic, these needles weigh less than comparable stainless steel interchangeables. Color-coded needles sizes come in silver, green, light blue, blue, purple, bronze, gold, light green. Knitters of all ages like the metallic sheen. When you use aluminum needles, you will hear a clicking sound when one needle comes into contact with another. This sound can be annoying to some knitters and the people around them, however, for others, it’s part of the knitting experience. For some knitters, the cable is too stiff for their projects (such as the Magic Loop Method). Instead of buying a new set, they simply create their own Boye NeedleMaster Interchangeable Cables! Knitters looking for speed and a tip built for lace weight yarns enjoy the advantages of working with these needles. While experienced knitters move from project to project quickly, beginning knitters may find the surface a bit slippery. Densified birch wood makes these needles as lightweight and durable as metal. Knitters who find the clicking of aluminum needles a bit annoying like the quieter knitting experience when using this colorful wooden set. Stainless steel with a bit of grip keeps stitches in place even for beginning knitters. Knitters appreciate the memory free cable for knitting in the round, but find it a bit stiff for magic loop. While these colorful needles get the work done, the finished details on tips and joins may not deliver like other brands. It’s a lot like the Boye Needlemaster Interchangeable Knitting Set in terms of material, length, needle sizes, tips, yarns and durability.